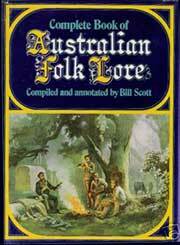 Bill Scott, eminent Australian folklorist, songwriter, poet, author, collector, etc. (he was involved in an immense range of activities) died on Christmas Eve. After naval service in the Second World War, Bill returned to work in several occupations, from which he drew much of the material for his stories, songs, and poems. He also became involved in collecting songs and folklore with Stan Arthur, John Callaghan, and Bob Michell (all of whom are now deceased). 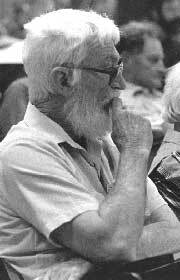 With others including Stan Arthur he was instrumental in starting the Folk Centre in Brisbane. He is probably best known for his song "Hey, Rain" and for his "Complete Book of Australian Folk Lore", but he wrote a number of books, autobiographical, fictional, and on folk music, lore, and tales. Without writing an immensely long article it is difficult to do him full justice. He had been in poor health for some time. He was 82. Thanks to Bob Bolton for the top-left photo taken at the National Folklore Conference at Kuringai CAE in the early 80s.